The Pie Shoppe opened in May 1947. 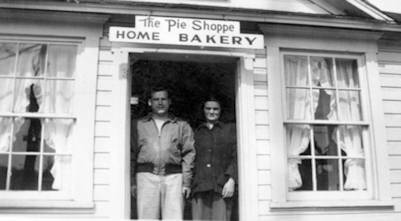 Arriving home after World War ll, Melvin Columbus and his mother, Mildred, combined their talents and opened The Pie Shoppe in the small village of Laughlintown. As a Navy cook, Melvin made homemade cinnamon rolls from the rations supplied on his battleship that was part of the fleet escorting the U.S.S. North Carolina. That cinnamon roll recipe is still used today. Before opening The Pie Shoppe, Mildred gained her baking expertise running a boarding house in Kregar, PA. She served delicious homemade pies, breads and rolls to her guests, many of whom were building the Pennsylvania Turnpike between Somerset and Donegal. In 1970, Melvin's youngest son, Tom, took over the business. Through the years, Tom has opened several other Pie Shops in the surrounding area: Ligonier, Latrobe and Donegal, but later sold his interest in them. 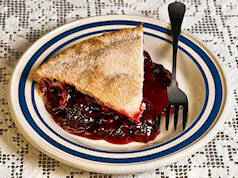 He added the fundraising aspect to The Pie Shoppe in 1986. 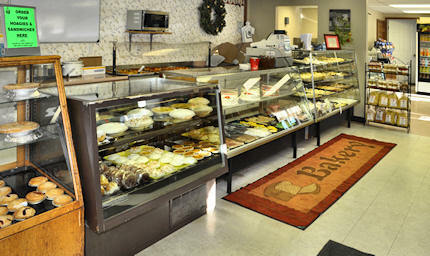 Tom sold the retail bakery in 2003 and continued to focus on the fundraising part of the business. Happily, he repurchased the retail bakery in 2012. So, 72 years later, the pies and rolls are still homemade here in Laughlintown, PA in our original bakery. We are the Original Pie Shoppe! Copyright © 2019 The Original Pie Shoppe, Inc.